I got a late email from Ray last night asking if I would like to join him and a few friends for an impromptu outing on Injun Creek. Little did I know at the time that the participants included Glen Cardwell and Gene McCarter, whose families had homes along the creek prior to the formation of the Park. Glen's family actually continued to live in the park under a lease arrangement until 1947, and Glen had a long and distinguished career as a Park Ranger in the Smokies. 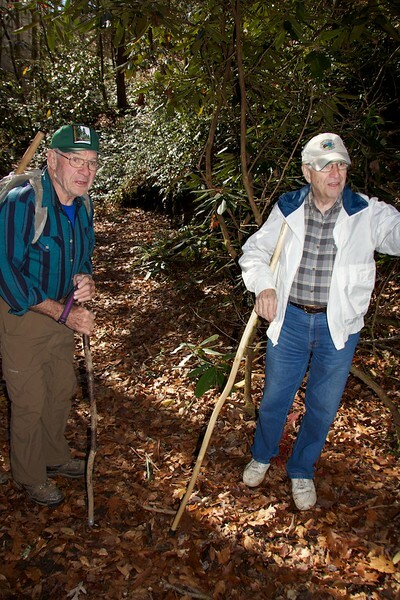 It was a real treat to go into the Smokies with two (dare I call them "old timers") with such an intimate knowledge of Smokies history.